Cut your favorite video segments out and extract the music/images from these video clips! Don't like some clips in your video? Want to remove the ads and features from your movie or show the highlight in your video with friends or people on the internet? No matter what kind of video formats, mediAvatar Video Cutter can help you cut any favorite clips out of your video, and get them converted instantly to other video formats. Download a free demo of mediAvatar Video Cutter now to explore more features, and cut your movies freely just as a movie clipper! Not only cut videos, but also get these video clips converted to nearly all video formats (AVI, MPEG, WMV, MP4, FLV, MKV, H.264/MPEG-4, DivX, XviD, MOV, M4V, VOB, ASF, 3GP, 3G2, SWF, H.261, H.264...) just like a video converter. Cut out the video clips you want then get them converted to audio files ( MP3, WMA, AAC, WAV, CDA, OGG, APE, M4A, AC3...), or extract images (PNG, JPG, BMP, GIF) from video segments. Easily cut videos to make them playable on iPad, iPhone, iPod, Apple TV, PSP, PS3, Zune, Xbox360, PMPs, Android Pad, Android phones, BlackBerry, 3GP phones, Wii, DS, Windows Phones... or stream them on the internet like on the YouTube. Keep the same video format, or change original format to almost any other video, audio or image formats. Up to yourself! Not only the basic parameters (video size, video/audio quality) to be adjusted, but also many other professional ones freely to twist. 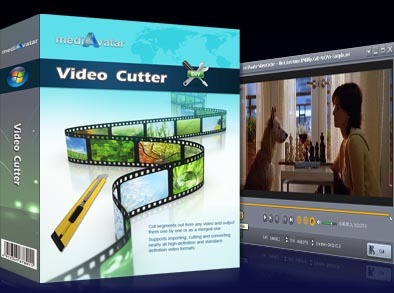 Cut and convert videos with mediAvatar Video Cutter with the unprecedented fast speed. Preset a post action (exit, hibernate, shut down or standby) after a task is done to save waiting time. AVI, MP4, WMV, FLV, VOB, DAT video joiner to merge videos in the same or different formats, even convert output join videos to popular formats for portable players. mediAvatar Video Splitter helps you split and convert any video into segments in any video, audio and picture formats.